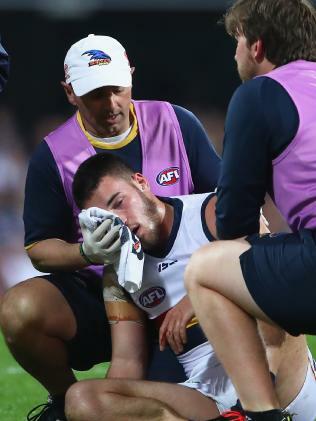 Adelaide’s Lachlan Murphy is attended after being concussed during the round 18 match against Brisbane Lions at The Gabba. Picture: Jason O'Brien/AFL Media/Getty Images. Has Sloane reinjured his foot? 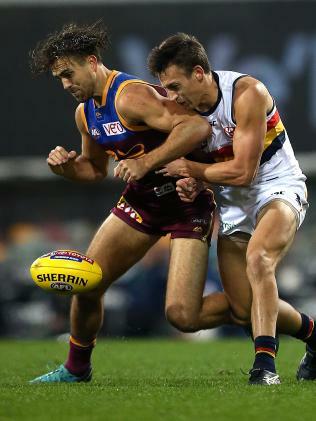 ADELAIDE has emerged with fresh concerns over Rory Sloane and standard of umpiring in Saturday night's hard-fought win against Brisbane at the Gabba. Dual club champion Sloane is four games back from the Lisfranc injury that ended Collingwood midfielder Dane Swan's career. 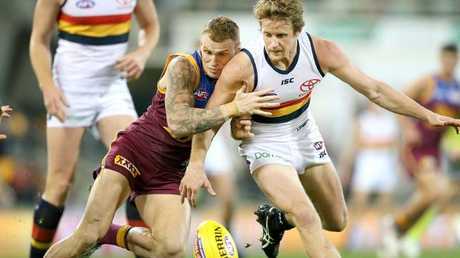 An Adelaide spokesman on Monday morning indicated Sloane - who this month signed five-year deal to remain at West Lakes - had pulled up sore from the brutal win against the Lions with his foot hurt by an opponent. "Rory's foot was trodden in the game on but at this stage there are no concerns," a Crows spokesman said. Crows great Mark Ricciuto says the exact nature of the vice-captain's injury is yet to be determined. "I did hear him say that he did hurt his foot in the game, I don't know if he just got stepped on, if he has re-injured his foot or if it was just a bruise," said Ricciuto of Sloane who missed rounds five to 13 with the Lisfranc injury, a foot ailment affecting weight bearing feared by all footballers. "Hopefully for Rory and the Crows sake he hasn't redone his foot, we will have to wait and see." AFL Match review boss Michael Christian on Monday must assess a headhigh tackle from Brisbane forward Daniel McStay that knocked out Rising Star-contending defender Tom Doedee early in the third term of the five-point win at the Gabba. 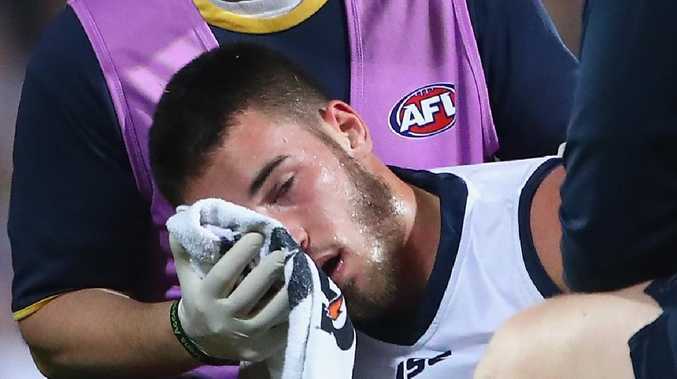 Rookie half forward Lachlan Murphy had his nose rearranged by a suspected errant elbow when sandwiched by two Brisbane players during a marking contest in the third term. Adelaide has noted through its social media arm that neither incident attracted a free from the umpires. "Hopefully Doedee and Murphy can pull up from their concussions. Wasn't that interesting umpiring on the weekend how they didn't even pay free kicks with those concussions," Ricciuto told Triple M.
Adelaide will welcome back skipper Taylor Walker from suspension while Richard Douglas (ankle) is a chance to resume against Melbourne at Adelaide Oval on Saturday night. Star defender Brodie Smith resumed from a knee reconstruction in style in the SANFL to press his claims for a first AFL start in 10 months. "Brodie Smith got through the SANFL with a team high 25 disposals and will be interesting to see how quick they bring him back to the AFL side, it might even be this week. Tex Waker will be back from suspension and Richard Douglas will close," said Ricciuto. Adelaide is in 12th place, a game and significant percentage behind Hawthorn in eighth spot but still in the race for final courtesy of Hugh Greenwood's four-goal effort against the Lions. "They just snuck in to keep their slim finals chances alive," said Ricciuto. "Greenwood did a fantastic job moving forward and that is something that Don Pyke has been created the last few weeks. Sloane and Bryce Gibbs have been rotating out of full forward as well and Greenwood was the goalkicker with four."